Legal Lean Sigma Institute certification courses, workshops, programs, retreats, and presentations are designed for legal and business professionals. All our privately delivered certification courses, workshops, programs, retreats, and presentations are designed and tailored for your group. We also offer a limited number of open enrollment courses during the year. If you are interested in hosting one, please contact us. Our approach is to introduce concepts and tools, then provide opportunities for attendees to apply them to a process they’re interested in improving. Through case studies and the use of success stories from law firms and legal departments, participants learn about process improvement and project management in relevant and immediately useful contexts. 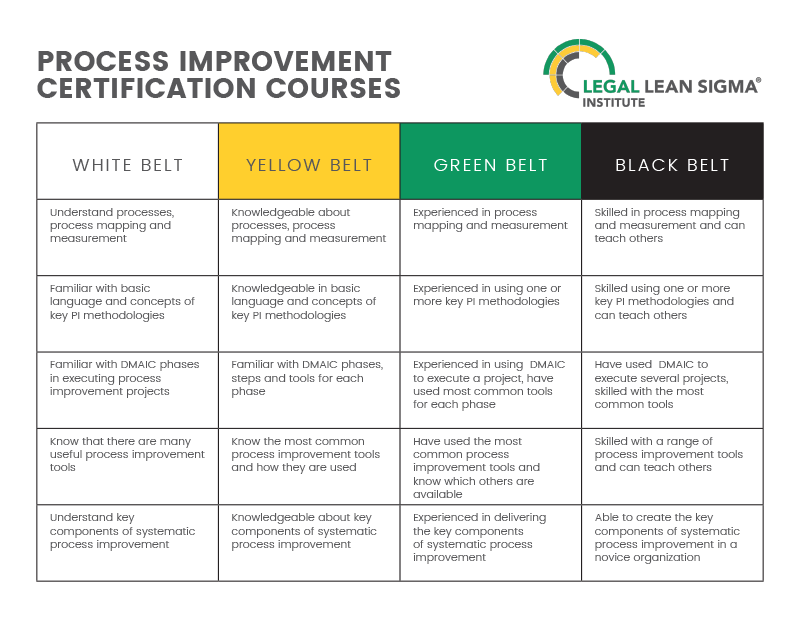 Legal Lean Sigma Institute White and Yellow Belt courses include experiential learning, table work, and interactive discussions. 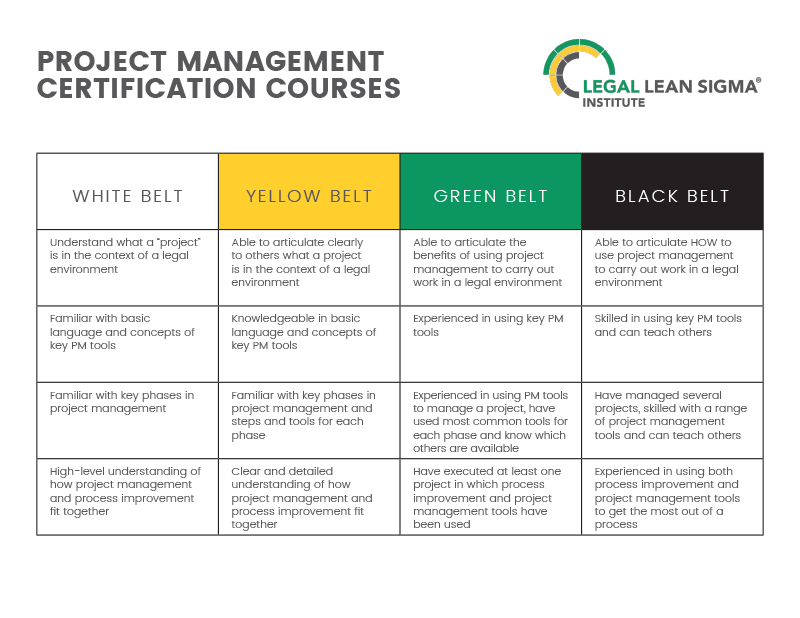 A Green Belt certification requires a Yellow Belt plus the successful completion of a project. Please contact us to discuss interest in a Green and/or Black Belt certification as these are tailored for each candidate. If you’re interested in an online course, the Process Improvement and Legal Project Management course is an excellent option. It is delivered by LLSI’s CEO and Founder, Catherine Alman MacDonagh, through Suffolk University Law School. This course is offered as a standalone and as part of Suffolk Law’s Legal Innovation and Technology Certificate Program. This was one of the best workshops I have attended and participated in over the last eight years… Content very well organized and easy to follow… Legal examples nicely tied to content… Practically delivered in bite-sized pieces…I learned a lot… very valuable…engaging, friendly, intelligent speaker… Would recommend… Course materials are excellent… Exceeded my expectations, which were high… Well planned, well documented, well led – well done!…The White Belt was an excellent introduction to process improvement and project management. Participation in a two day, more intensive course that is designed for participants to be able to understand and employ Lean, Six Sigma and Legal Project Management vocabulary, methodologies, and tools. All our privately delivered course, workshops, programs, retreats, and presentations are tailored and designed specifically for your group. Processes, projects, and teams are selected in advance. For the workshop components of privately delivered certification courses, attendees learn together, begin drafting deliverables such as project charters and rough process maps, earn a certification and, in most cases, are eligible for CLE credit. We received a complete introduction to this very comprehensive material in a way that allowed us to take away practical means to begin implementing the concepts as part of our work. Your facilitation met the class at its various participant needs and your design/structure allowed the teams to work on practical application in a way that reinforced the concepts via your own work/design. Interested in downloading a complimentary presentation on Legal Lean Sigma?